Has anyone seen this makers mark before? It is on a 19th century flask. Possibly once used for medicinal purposes. As far as the mark goes, I am not seeing letters in this (as in a monogram) - Do you? The shape suggests laundry bluing. Have seen many labeled examples in this specific shape. Your bottle dates to the late 19th century. Thank you! There are no other letters or markings on the bottle, just that maker's mark. 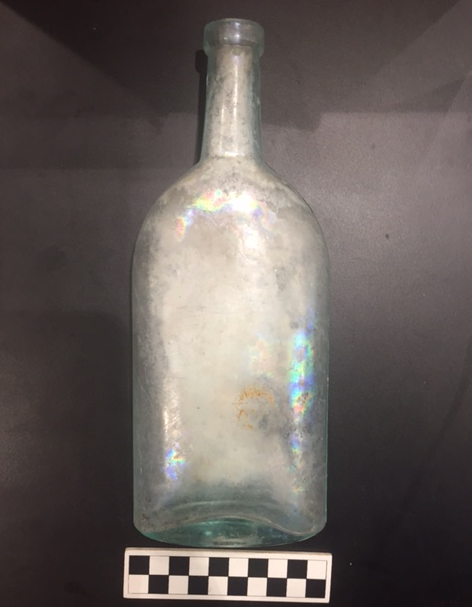 We found another bottle of bluing agent in the same context (this in an archaeological project) so that would make sense. However, that bottle is much smaller, differently shaped and clearly labeled as such product.